A touch screen kiosk is a physical (hardware and software) addition to your business or organization that invites human interaction. Kiosks come in all shapes and sizes, from a simple countertop iPad to a 55 inch industrial LCD monitor housed in a custom surround and sealable against dust and water. They can assist in providing, goods, services, information, or self-service. With the rise of customizable kiosk software, businesses large and small are reaping the benefits of adding a kiosk to their environment. Whether you have something to sell, teach, or operate, an interactive touch screen kiosk placed outside your door can slice through your overhead costs by working for your business 24 hours a day, seven days a week. Remove threats of inclement weather, reduce sick-day stress, or holiday closings, and be in front of your consumer when they need you. Consumers and employees are faced with thousands of messages every day. You can quickly and easily edit your dynamic kiosk software to provide your customers with the right message at the right time. Increase internal efficiency by moving away from paper-based methods. Change a product, search through a directory, or update a contact form without sifting through old files. Do you have a museum exhibit, memorial, statue, or building on your property that has a rich history, lesson, or background you want to convey? An interactive touch screen kiosk can hold all the information you need to make your story come alive in a compelling way – any time, day or night. Enhance your visitor experience with a museum kiosk that shares information interactively. The only thing better than a visual exhibit is a multi-sensor one. 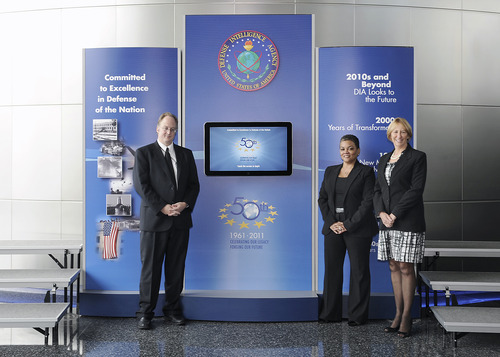 Whether you’re a business celebrating 20 years of service or a town center celebrating a 100th anniversary, a touch screen kiosk can highlight and showcase all of the milestones from your journey on an interactive timeline. Sports, government, higher education, architecture, an enterprise company or small business: no matter what the field, a touch screen kiosk with your organization’s history can sharpen the focus and be a sophisticated addition to your special event. Build your brand loyalty with software and display monitors designed with your logo and any other brand standards. Enhance your sales process by leading your consumer down a clear path to purchase, right from your touch screen monitor. Educate readers about your long and rich history from a touch screen display.